Why is our Cozumel Jeep Tequila Tour the best? Most countries have a national spirit, and Mexico is not an exception. We are talking about tequila; this is a world-renowned drink based on blue agave. Similar to other spirits, there are many different types of tequila drinks out there. It looks like every region has a specific procedure for preparing tequila and if you head to Cozumel, you should try local tequila. The best option you have is to take Cozumel Jeep Tequila Tour. What makes our Jeep & Tequila Factory Tour in Cozumel so unique? There is more than one jeep tour in cozumel like this which is quite logical. Tourists in Cozumel like to unwind and relax and tasting tequila is one way to do this. If you want to get the most from this unique experience, you should use the best tour. According to many satisfied travelers, My Cozumel Jeep Tequila Tour is the best around. Also, this is an official discovering tour. It means that the journey is not focused only on tasting tequila, but also on doing other fun things on this exotic island located in the Caribbean Sea. So, besides the tequila part, you will also have a chance to visit a few of the most beautiful beaches in Cozumel. You will also enjoy a snorkel tour in the second largest reef system on our planet; this is an adventure that you will gladly talk about in the upcoming years. How is the experience of the Cozumel Hacienda Antigua Tequila Tour? Hacienda Antigua is the place where this jeep excursions will lead you; this is where the magic happens. You can find the tasty tequila made in Cozumel in Hacienda Antigua at reasonable prices. Every tour has a professional guide that is well-informed, knowledgeable and interesting. With the help of the staff of Hacienda Antigua, they will help you learn more about the process of making tequila; this is a process that involves a few steps. As we said before, the tequila in Cozumel, just like traditional tequila across Mexico, is made of blue agave and a few other ingredients. At the same time, visitors will also learn more about the history of the national spirit of Mexico with a particular reference to the history of tequila in Cozumel. You will understand what tequila means for the tradition and culture of Mexico. Of course, you will also have an opportunity to try a shot or two of tequila made in Hacienda Antigua. You will learn how to drink tequila in the right way. Visitors should feel free to buy a bottle of tequila while they are in Hacienda Antigua. Why is the Tequila Jeep Tour a must-go when heading to Cozumel? My Jeep Tours are the perfect tours for those who want to unveil the natural beauties of Cozumel Island, the history of this island and some traditions like the tequila making process. These tours use new Jeep Wrangler vehicles, and they come with an experienced guide who knows everything there is to know about Cozumel Island. 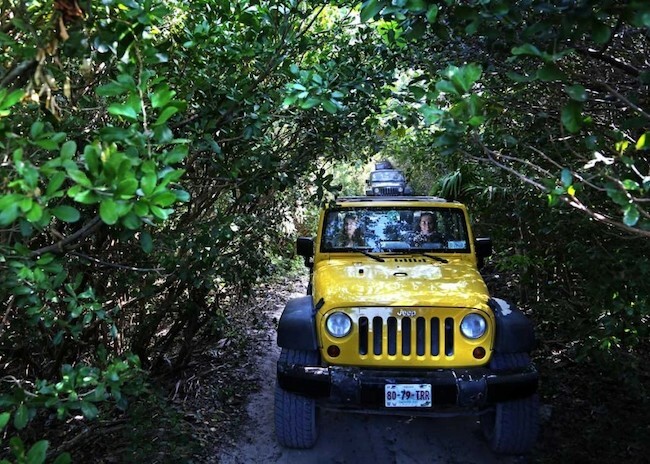 When in Cozumel, take the Cozumel Jeep Tequila Tour because this is a journey you’ll never forget.